Engaging children on the autistic spectrum is often challenging for teachers, therapists and parents. Although the techniques and particular toys vary, experts agree that toys are a wonderful way to break down communication barriers and enable children on the spectrum to learn and grow. Paul Weihrauch, an occupational therapist by trade and president of TheraPro, founded his company about 15 years ago to provide a central location for toys that he and wife Karen considered useful to children with special needs. Over the years, as they realized that most toys were created without such children in mind, TheraPro became the toy creator as well as the toy distributor. Currently, TheraPro provides toys, books, multimedia and more to educators and families. · Calmness. 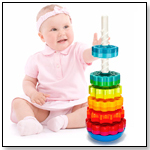 Children on the spectrum often need toys that will help calm them and enable them to focus. According to Clarissa Willis, Ph.D. vice president, intellectual property, for Kaplan Early Learning Company with a retail location in Lewisville, NC, “One of the defining characteristics of autism is the need to have things in the environment which help the child with the sensory overload that he often experiences.” She suggested a collection from the Kaplan website: Fun Floppy Foam Brushes, Teachable Touchable Texture squares, Textured Touch and Trace Survival words, SloMo™ Ball, Plexiglass mirror, Red School House Tent, and The Preschool Photo Activity Library. · Understanding cause and effect. Toys that specifically demonstrate cause and effect may effectively engage children. "Something that vibrates or lights up or plays music — any of those things really draw the child in," Sue Seiler, director of Kidabilities therapy center in Hawthorne, N.Y., told TDmonthly. · Appropriateness. Sometimes children on the spectrum become fascinated by one part of a toy and hit the same button over and over or make the toy play the same sound constantly. In these cases, the child’s play with the toy must be monitored. Giangrande said, “If we can get kids playing appropriately with toys that [repetitive] behavior decreases over time.” Repetitive play is one of the drawbacks from toys with immediate feedback, cautions Giangrande, which is why monitoring play is necessary. The goal is to cut down on repetitive behaviors and have the child use the toy more and more appropriately over time. · Social Interaction. 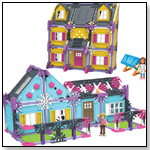 Toys are the perfect way to encourage social interaction for children that often desire to play alone. The Weihrauchs concluded that the best toys for social interaction are toys that both the special needs child and others in the family like at the same time. This, they said, makes it easier for the child with a spectrum disorder to begin to learn how to play with others, rather than just toys. They pointed to train sets and other toys that invite children to work together on an activity. Below is a table that can help you select the right toy for the particular skill set the child needs. •Will Thomas the Train Rescue Mega Brands? · Ride a Barbie Jeep...to College? Why not? !